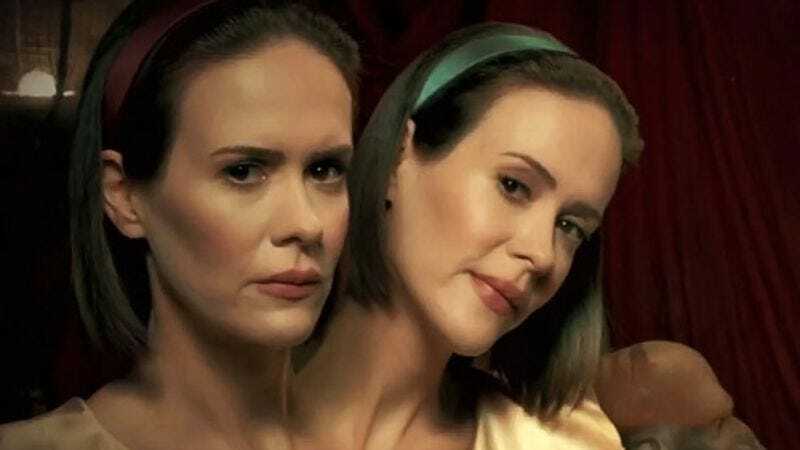 Ever since American Horror Story: Freak Show began releasing promo images, fans have wondered how actress Sarah Paulson would play conjoined twins Bette and Dot Tattler. Now, in the wake of the show’s premiere last night, Ryan Murphy has given a new interview to The Hollywood Reporter in which he explains that. While most actors on the show take about five hours to film a given scene, it takes Paulson 12 to 15 hours to complete a scene with the siblings. Not only does Paulson have to shoot close-ups, medium shots, and a master recording as both twins, she also has to spend additional time for green screen, over-the-shoulder shots, and so on. Hollywood actresses beware: Paulson and Orphan Black’s Tatiana Maslany (who similarly plays multiple characters with the help of complicated special effects), may soon monopolize every female role on TV.